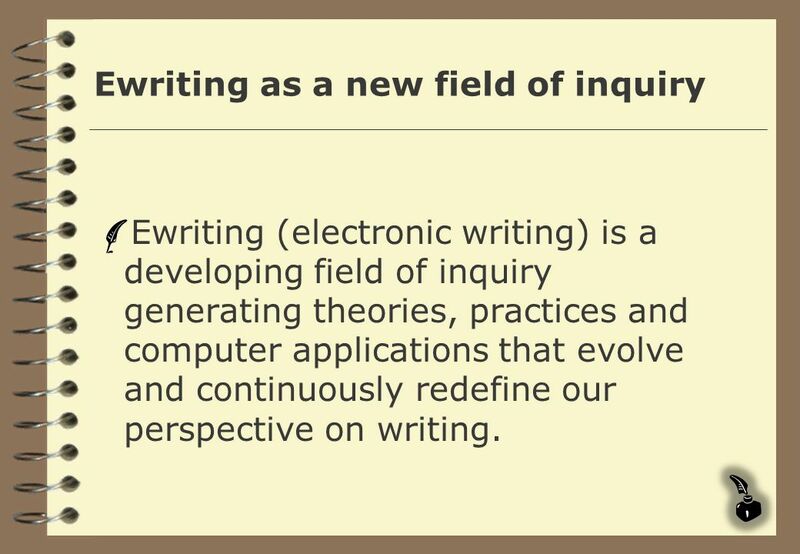 Ewriting (electronic writing) is a developing field of inquiry generating theories, practices and computer applications that evolve and continuously redefine our perspective on writing. 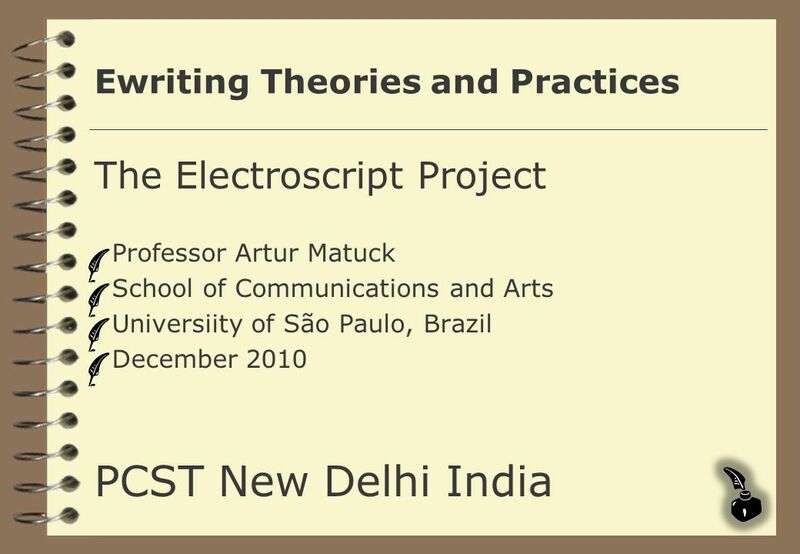 The whole idea of the computer as a writing tool is now associated with telecommunication. 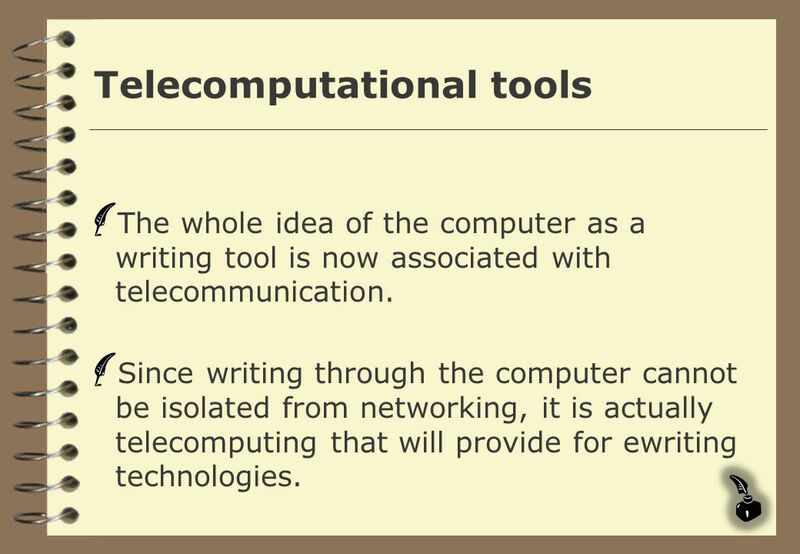 Since writing through the computer cannot be isolated from networking, it is actually telecomputing that will provide for ewriting technologies. 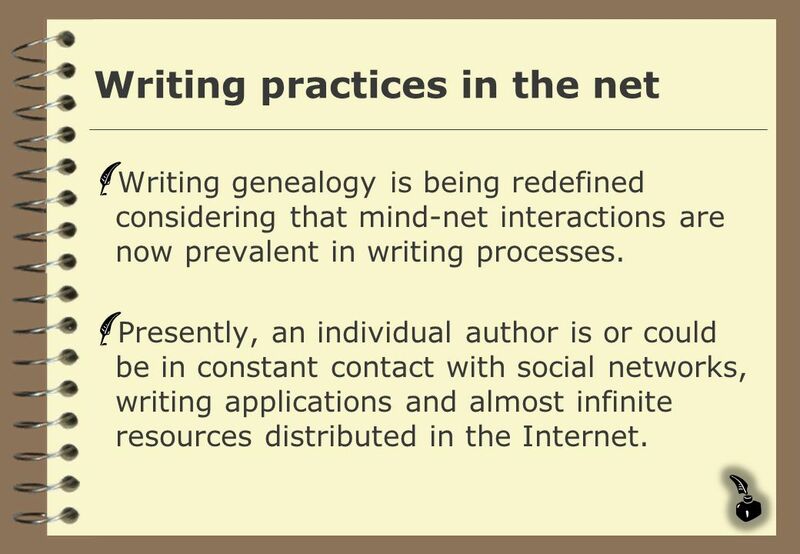 Writing genealogy is being redefined considering that mind-net interactions are now prevalent in writing processes. Presently, an individual author is or could be in constant contact with social networks, writing applications and almost infinite resources distributed in the Internet. 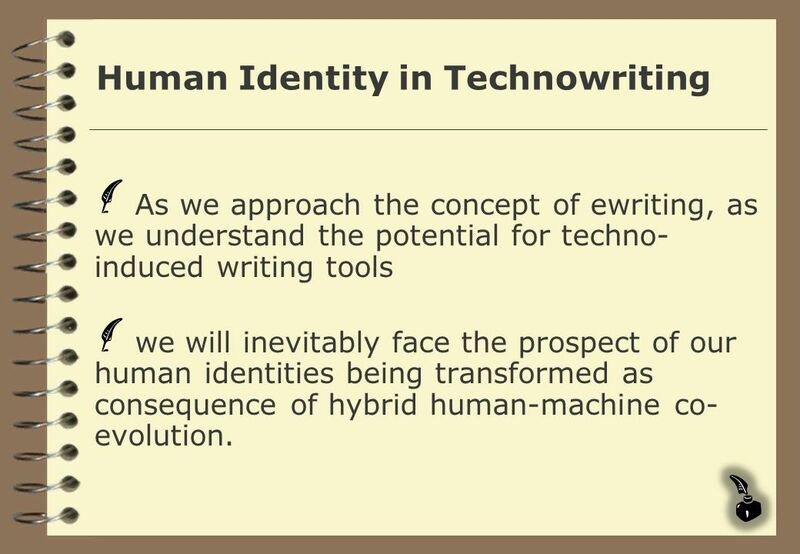 As we approach the concept of ewriting, as we understand the potential for techno-induced writing tools we will inevitably face the prospect of our human identities being transformed as consequence of hybrid human-machine co-evolution. The human mind, as an authorial entity, is acquiring a different nature. It is becoming translocal, as writing fills cyberspace, as networks connect in authorial nodes. 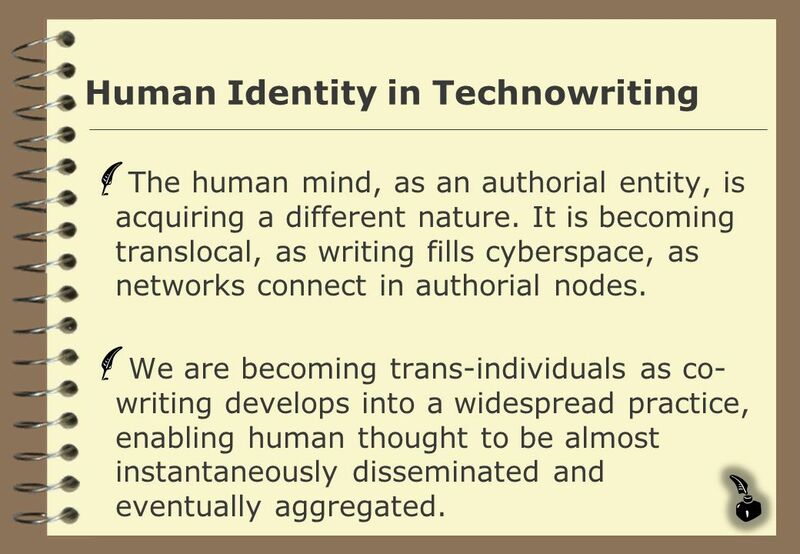 We are becoming trans-individuals as co-writing develops into a widespread practice, enabling human thought to be almost instantaneously disseminated and eventually aggregated. 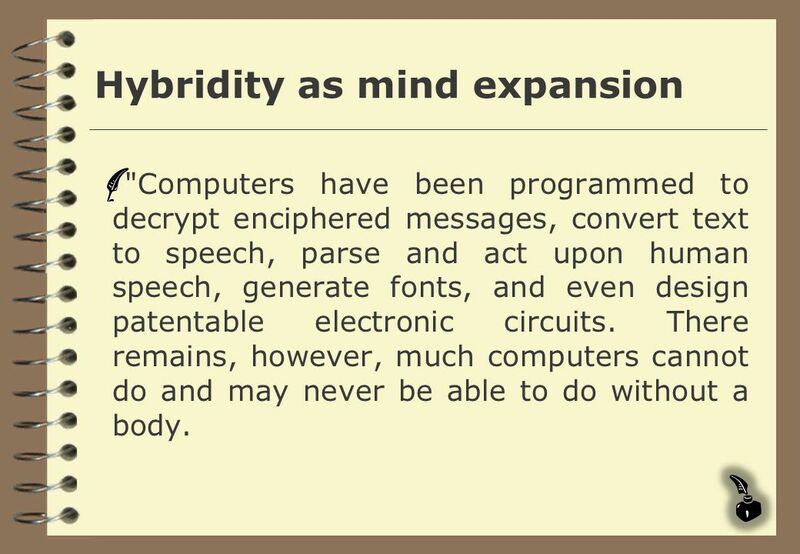 "Computers have been programmed to decrypt enciphered messages, convert text to speech, parse and act upon human speech, generate fonts, and even design patentable electronic circuits. There remains, however, much computers cannot do and may never be able to do without a body. 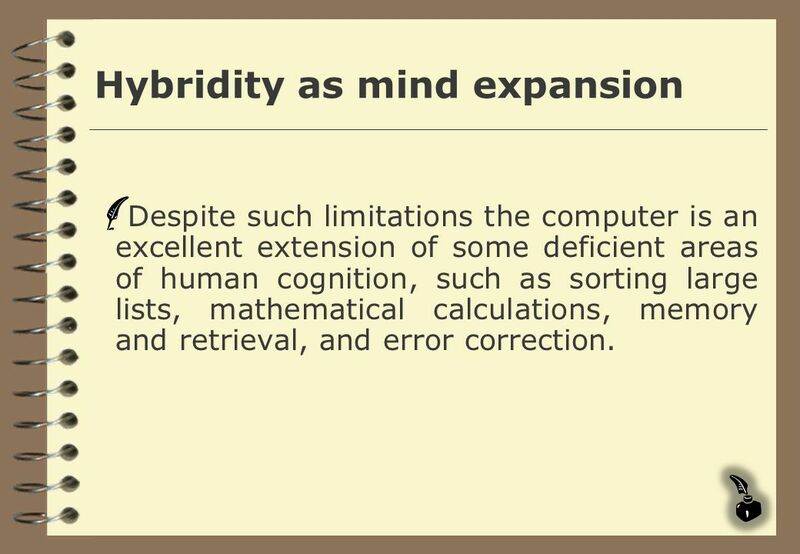 Despite such limitations the computer is an excellent extension of some deficient areas of human cognition, such as sorting large lists, mathematical calculations, memory and retrieval, and error correction. 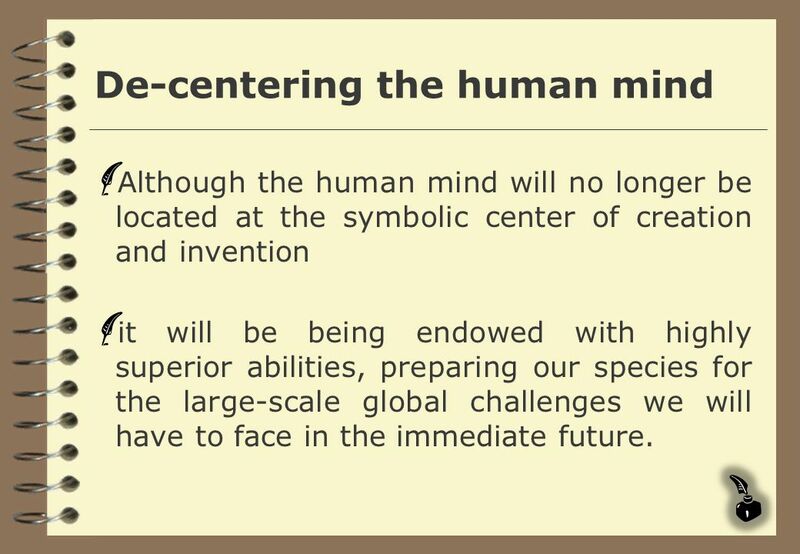 Although the human mind will no longer be located at the symbolic center of creation and invention it will be being endowed with highly superior abilities, preparing our species for the large-scale global challenges we will have to face in the immediate future. 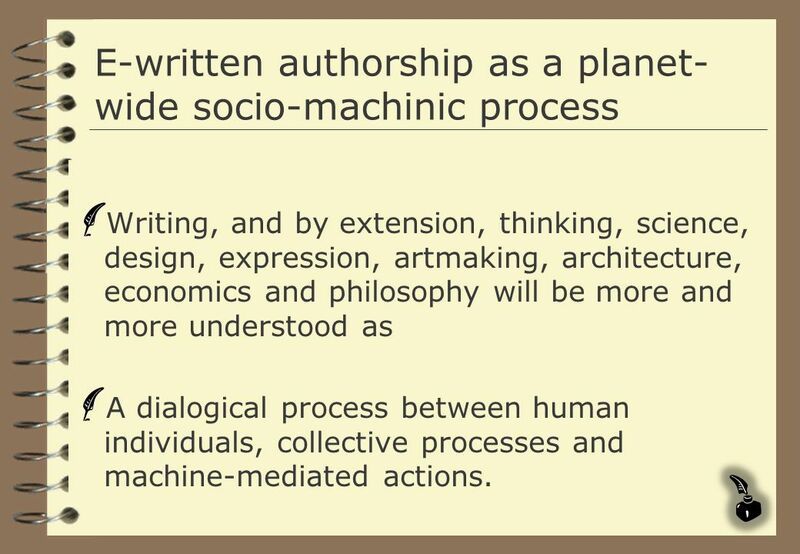 Writing, and by extension, thinking, science, design, expression, artmaking, architecture, economics and philosophy will be more and more understood as A dialogical process between human individuals, collective processes and machine-mediated actions. computador tem, portanto, o potencial de inaugurar uma maneira não-linear de escrever. Através de sistemas computacionais pode-se conceber métodos para se combinar ou recombinar componentes textuais em novas formulações, gerando textos inteiros em frações de segundos. 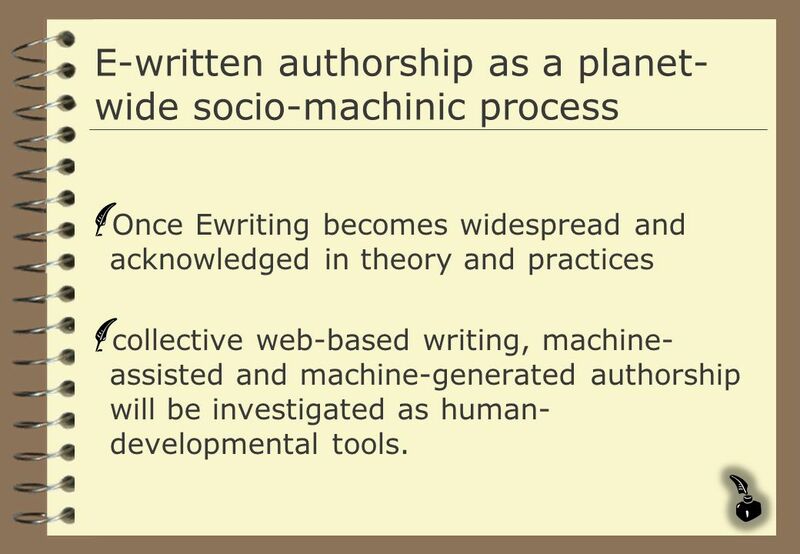 Once Ewriting becomes widespread and acknowledged in theory and practices collective web-based writing, machine- assisted and machine-generated authorship will be investigated as human- developmental tools. computador tem, portanto, o potencial de inaugurar uma maneira não-linear de escrever. Através de sistemas computacionais pode-se conceber métodos para se combinar ou recombinar componentes textuais em novas formulações, gerando textos inteiros em frações de segundos. 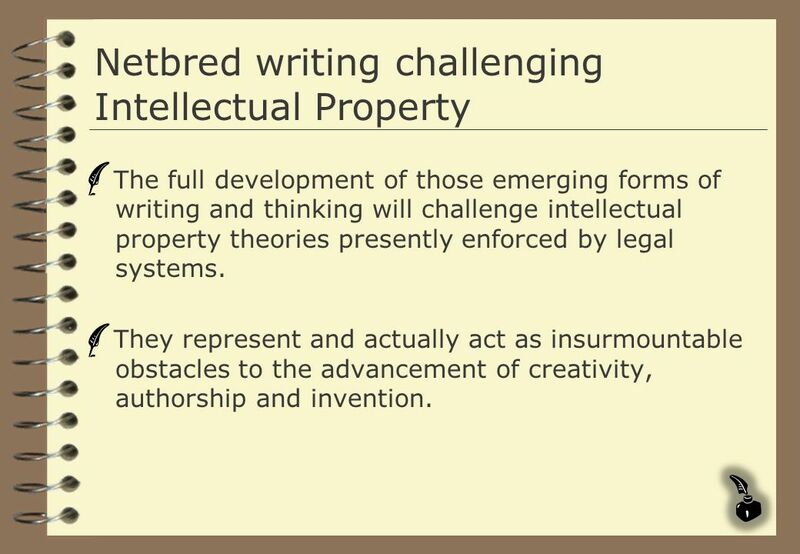 The full development of those emerging forms of writing and thinking will challenge intellectual property theories presently enforced by legal systems. 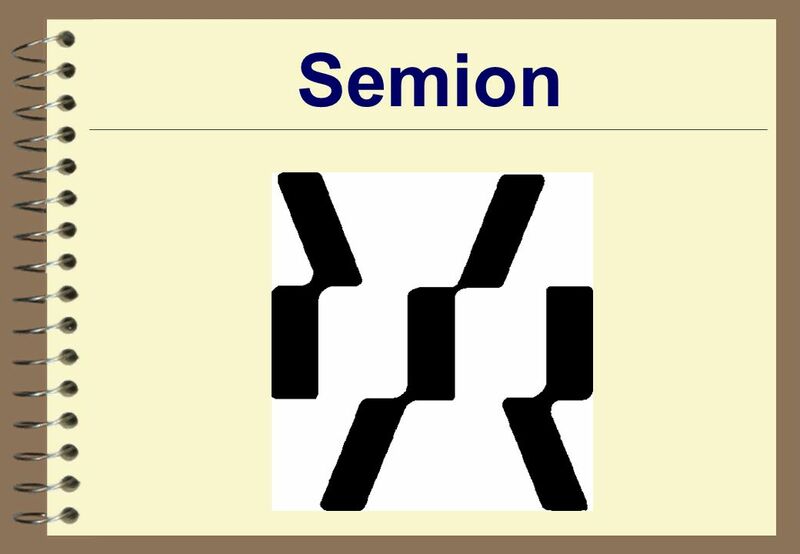 They represent and actually act as insurmountable obstacles to the advancement of creativity, authorship and invention. computador tem, portanto, o potencial de inaugurar uma maneira não-linear de escrever. Através de sistemas computacionais pode-se conceber métodos para se combinar ou recombinar componentes textuais em novas formulações, gerando textos inteiros em frações de segundos. Legal theories and legislations ingrained in almost unchangeable statutes restrain emerging collaborative authorship models and practices. 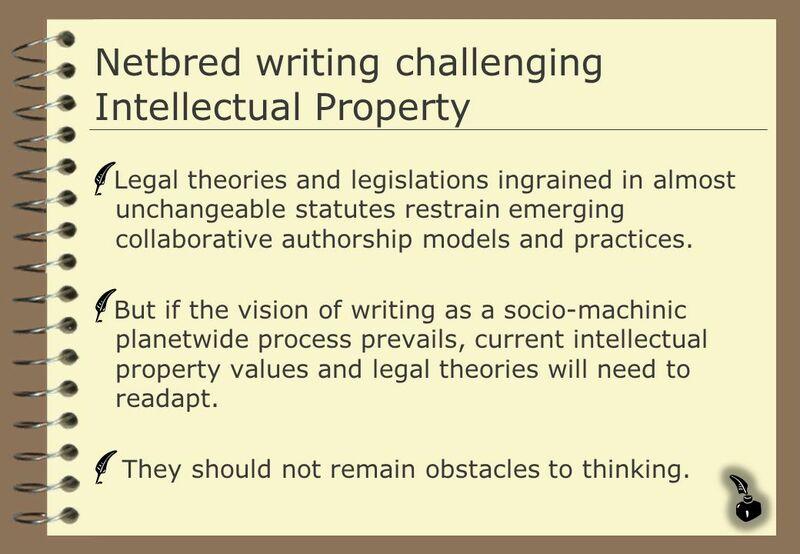 But if the vision of writing as a socio-machinic planetwide process prevails, current intellectual property values and legal theories will need to readapt. They should not remain obstacles to thinking. computador tem, portanto, o potencial de inaugurar uma maneira não-linear de escrever. Através de sistemas computacionais pode-se conceber métodos para se combinar ou recombinar componentes textuais em novas formulações, gerando textos inteiros em frações de segundos. They would be confronted in their ideology, assumption to large-scale control, and imposed authority. Finally, they would be proven to be obsolete tenets of an old mentality and would thus have to be rethought. 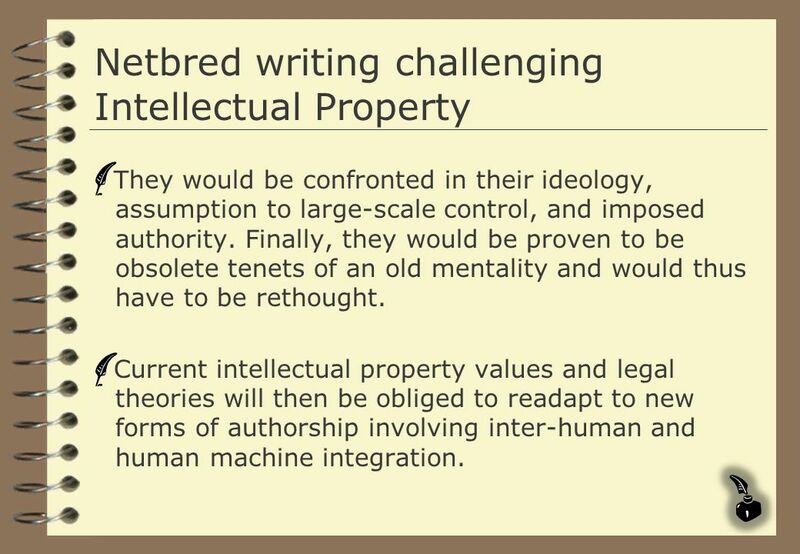 Current intellectual property values and legal theories will then be obliged to readapt to new forms of authorship involving inter-human and human machine integration. computador tem, portanto, o potencial de inaugurar uma maneira não-linear de escrever. Através de sistemas computacionais pode-se conceber métodos para se combinar ou recombinar componentes textuais em novas formulações, gerando textos inteiros em frações de segundos. 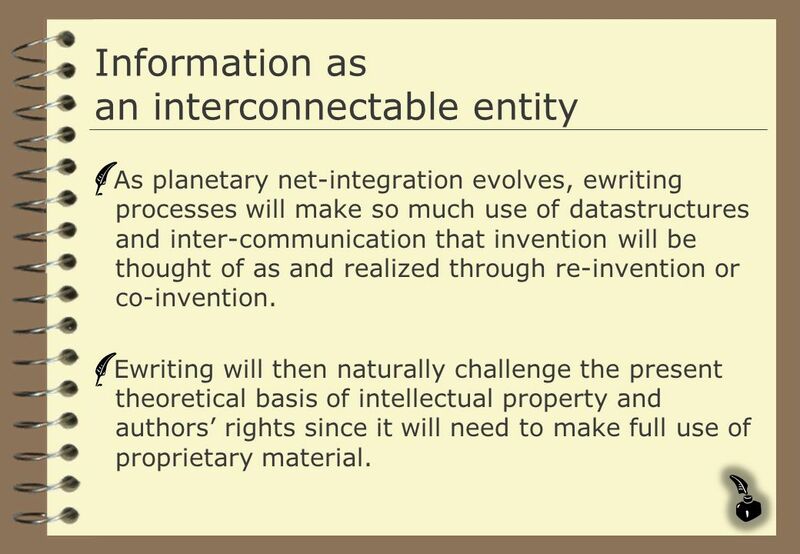 As planetary net-integration evolves, ewriting processes will make so much use of datastructures and inter-communication that invention will be thought of as and realized through re-invention or co-invention. 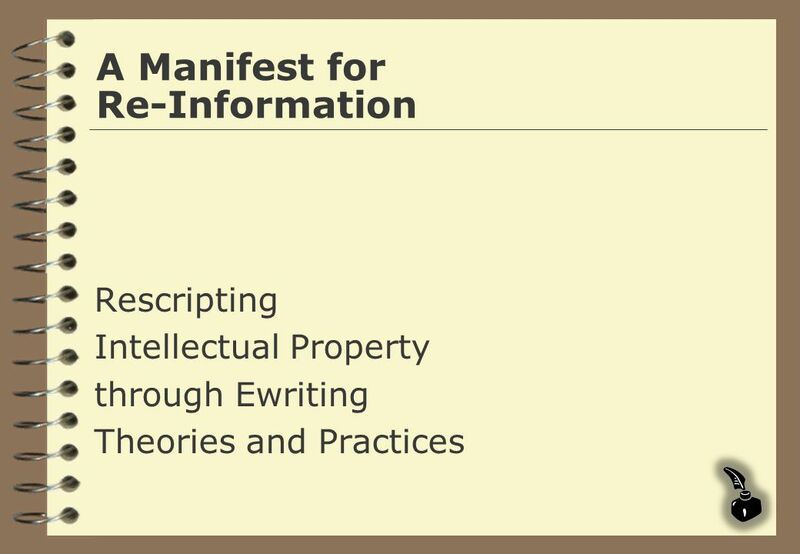 Ewriting will then naturally challenge the present theoretical basis of intellectual property and authors’ rights since it will need to make full use of proprietary material. computador tem, portanto, o potencial de inaugurar uma maneira não-linear de escrever. Através de sistemas computacionais pode-se conceber métodos para se combinar ou recombinar componentes textuais em novas formulações, gerando textos inteiros em frações de segundos. 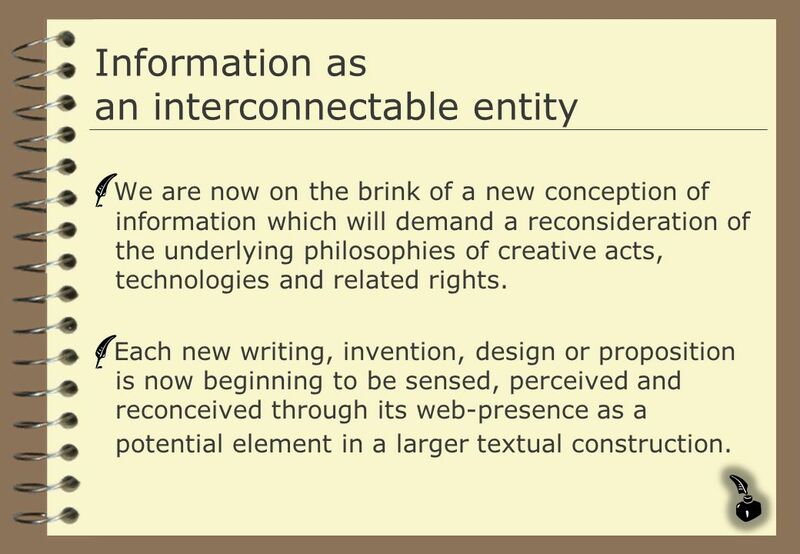 We are now on the brink of a new conception of information which will demand a reconsideration of the underlying philosophies of creative acts, technologies and related rights. Each new writing, invention, design or proposition is now beginning to be sensed, perceived and reconceived through its web-presence as a potential element in a larger textual construction. computador tem, portanto, o potencial de inaugurar uma maneira não-linear de escrever. Através de sistemas computacionais pode-se conceber métodos para se combinar ou recombinar componentes textuais em novas formulações, gerando textos inteiros em frações de segundos. 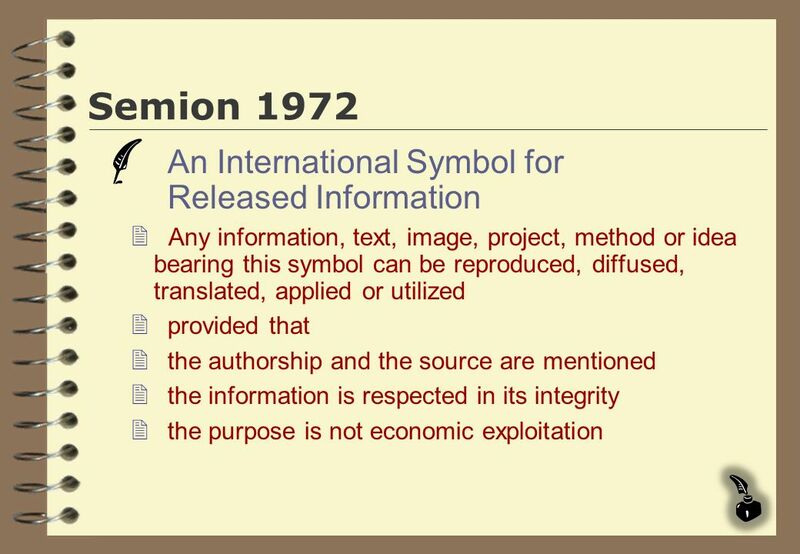 Information would then be considered as re-information, as data-in-flux. It will be increasingly analyzed within new parameters such as availability, interconnectivity, formatibility, translatibity and disseminability. 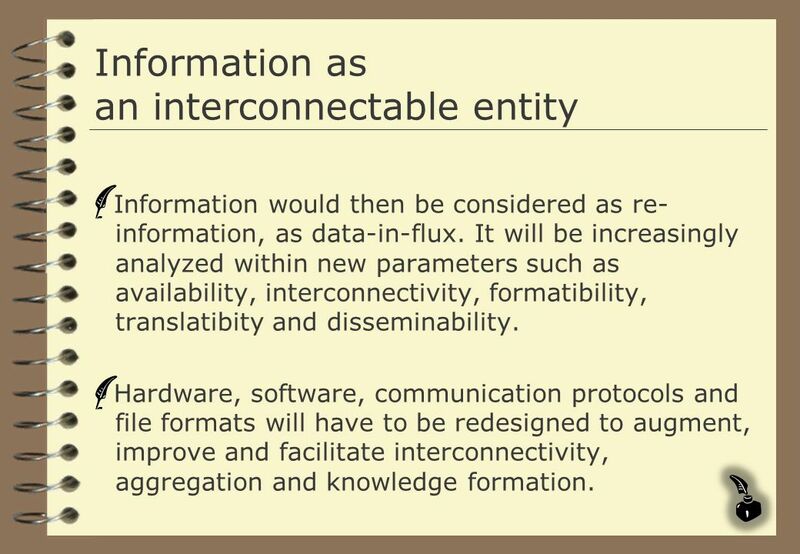 Hardware, software, communication protocols and file formats will have to be redesigned to augment, improve and facilitate interconnectivity, aggregation and knowledge formation. computador tem, portanto, o potencial de inaugurar uma maneira não-linear de escrever. Através de sistemas computacionais pode-se conceber métodos para se combinar ou recombinar componentes textuais em novas formulações, gerando textos inteiros em frações de segundos. 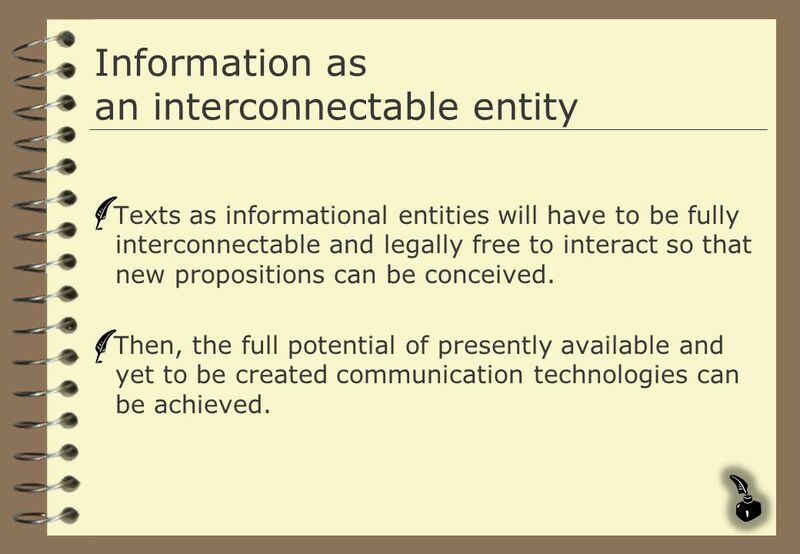 Texts as informational entities will have to be fully interconnectable and legally free to interact so that new propositions can be conceived. Then, the full potential of presently available and yet to be created communication technologies can be achieved. computador tem, portanto, o potencial de inaugurar uma maneira não-linear de escrever. Através de sistemas computacionais pode-se conceber métodos para se combinar ou recombinar componentes textuais em novas formulações, gerando textos inteiros em frações de segundos. 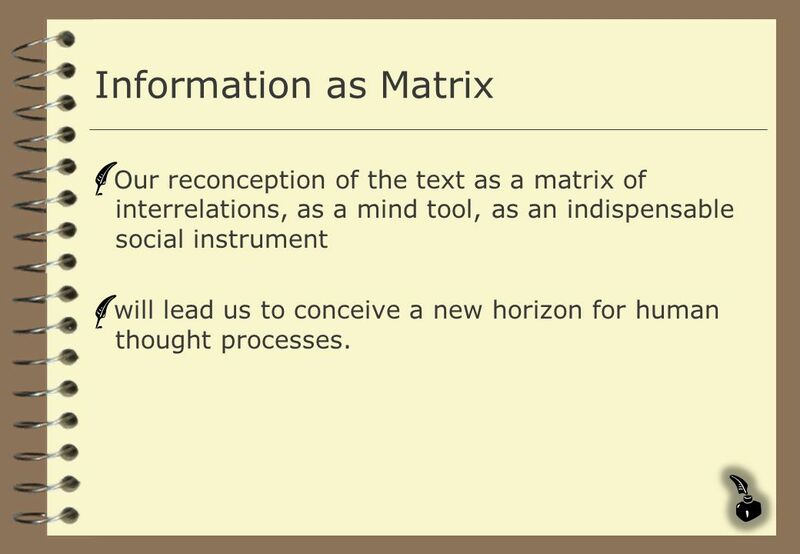 24 Information as Matrix Our reconception of the text as a matrix of interrelations, as a mind tool, as an indispensable social instrument will lead us to conceive a new horizon for human thought processes. computador tem, portanto, o potencial de inaugurar uma maneira não-linear de escrever. Através de sistemas computacionais pode-se conceber métodos para se combinar ou recombinar componentes textuais em novas formulações, gerando textos inteiros em frações de segundos. 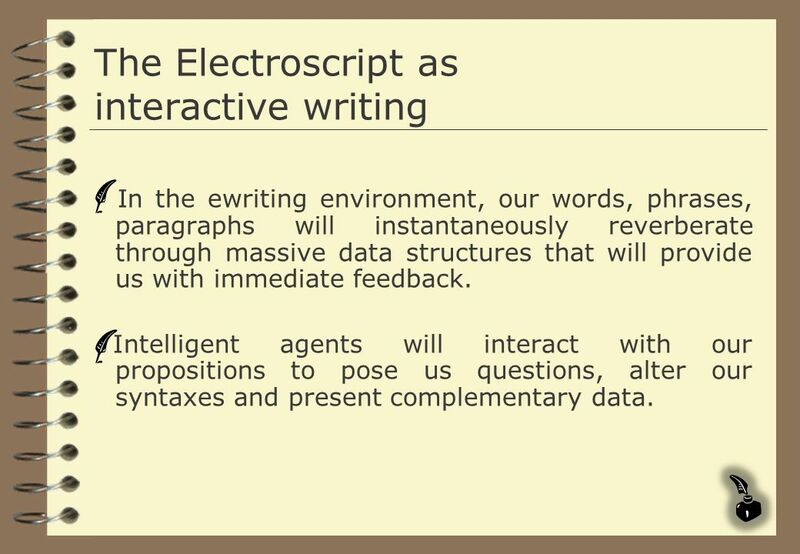 In the ewriting environment, our words, phrases, paragraphs will instantaneously reverberate through massive data structures that will provide us with immediate feedback. Intelligent agents will interact with our propositions to pose us questions, alter our syntaxes and present complementary data. 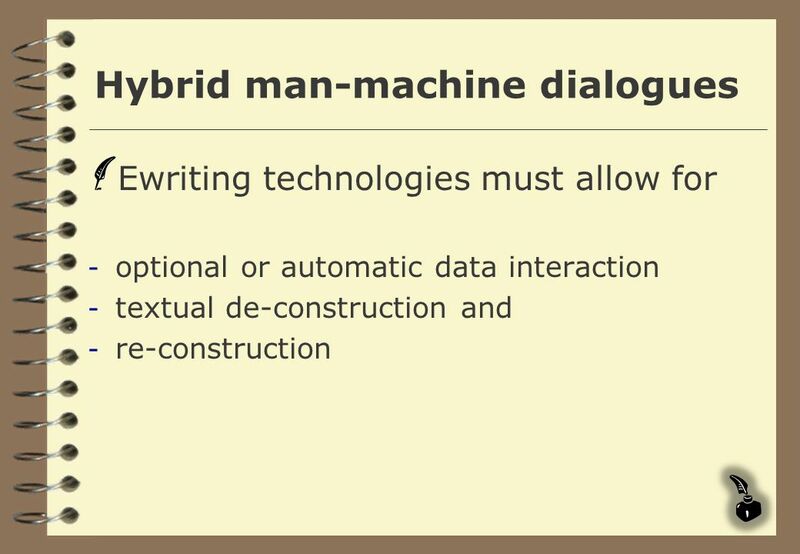 Ewriting tools will challenge deep-rooted cultural habits at the base of our language and thought processes. 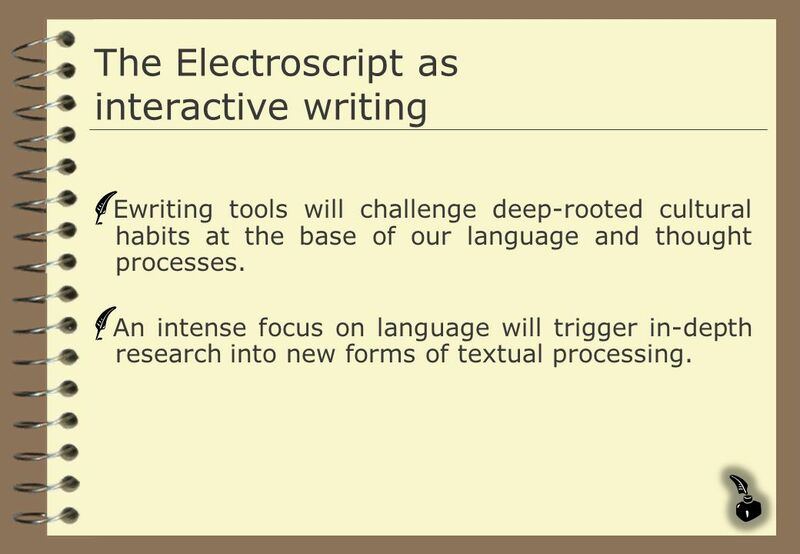 An intense focus on language will trigger in-depth research into new forms of textual processing. 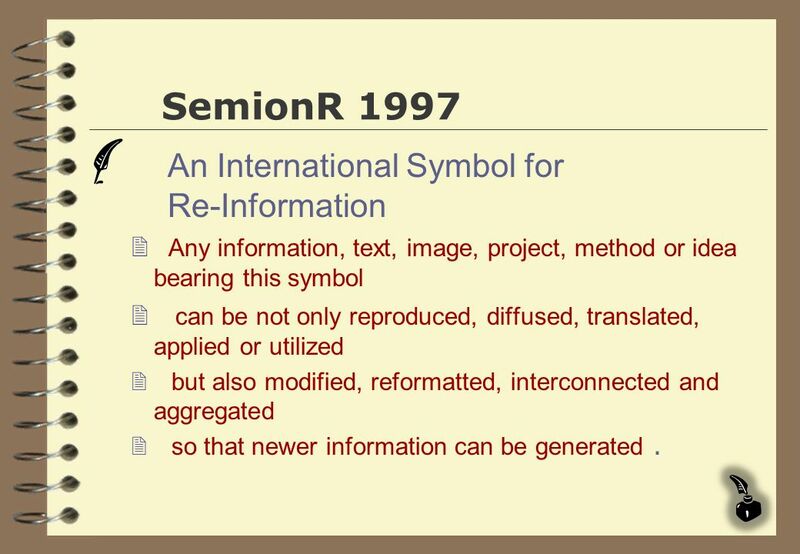 Any information, text, image, project, method or idea bearing this symbol can be not only reproduced, diffused, translated, applied or utilized but also modified, reformatted, interconnected and aggregated so that newer information can be generated . 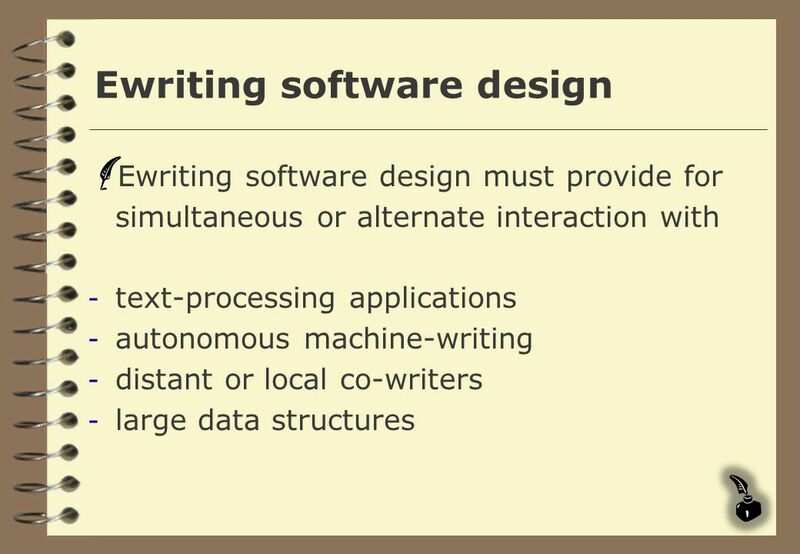 Download ppt "Ewriting Theories and Practices"
1 Toward a Modeling Theory for Predictable Complex Software Designs by Levent Yilmaz Auburn Modeling and Simulation Laboratory Department of Computer Science. 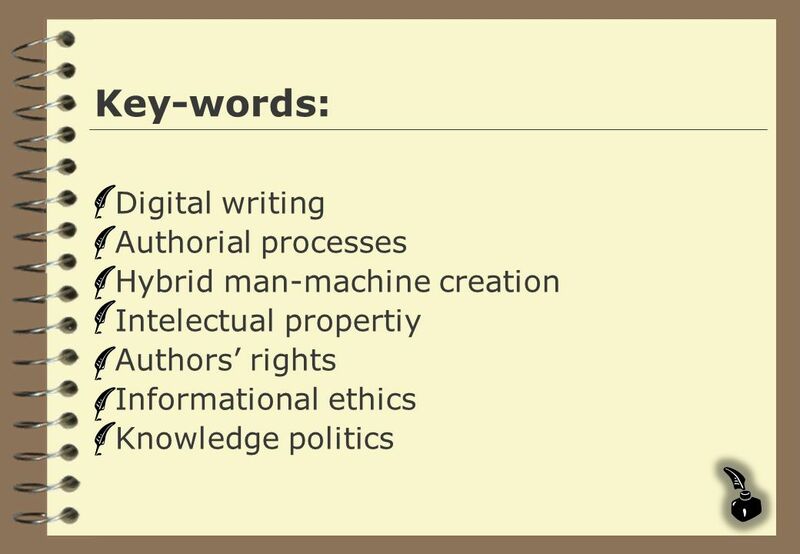 Computational Paradigms in the Humanities – eHumanities and their role and impact in transdisciplinary research Gerhard Budin University of Vienna. Some questions o What are the appropriate control philosophies for Complex Manufacturing systems? Why??? ?Holonic Manufacturing system o Is Object -Oriented. Systems Analysis and Design Feasibility Study. Introduction The Feasibility Study is the preliminary study that determines whether a proposed systems. Virtual Organization in Libraries: Necessity or Luxury of the Future? Anthi Katsirikou Technical University of Crete George Bokos Ionion University. Fifth Workshop on Link Analysis, Counterterrorism, and Security. or Antonio Badia David Skillicorn. Resources, Agents and Processes in the context of Next Generation World Wide Web Dr. Evgeny Osipov Head of Communication Networks group Luleå University. Revolution Yet to Happen1 The Revolution Yet to Happen Gordon Bell & James N. Gray (from Beyond Calculation, Chapter 1) Rivier College, CS699 Professional. 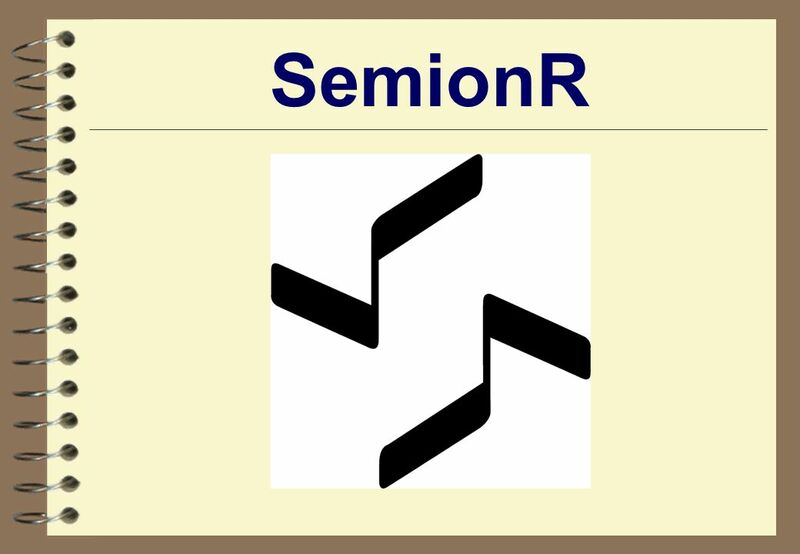 Agent-Based Acceptability-Oriented Computing International Symposium on Software Reliability Engineering Fast Abstract by Shana Hyvat. Enhance legal retrieval applications with an automatically induced knowledge base Ka Kan Lo. A Portrait of the Semantic Web in Action Jeff Heflin and James Hendler IEEE Intelligent Systems December 6, 2010 Hyewon Lim.